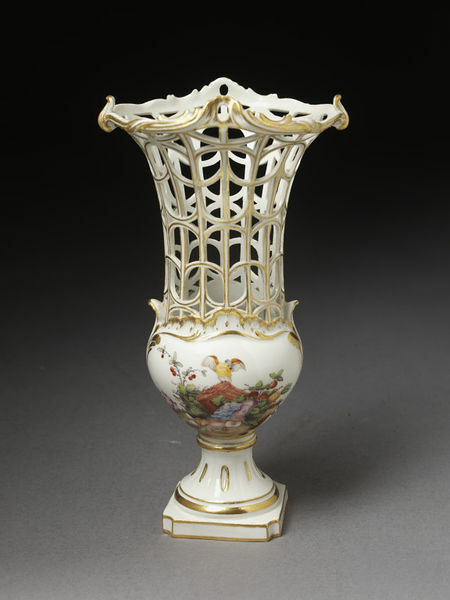 Vase of hard-paste porcelain painted with enamels and gilded. Short bulbous body with a spreading circular foot on a plinth, and a long funnel-shaped neck decorated with openwork. 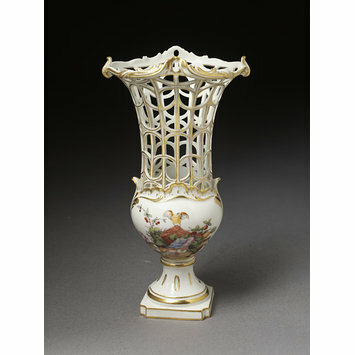 The rim is moulded with rococo scrolls. The body is divided by foliated ornament into two compartments, one painted with a group of a bird, basket, fruit, vegetables and flowers, and the other with floral festoons. Purchased from Minton & Co.
Vase of hard-paste porcelain painted with enamels and gilded, Oude Loosdrecht porcelain factory, Oud Loosdrecht, 1771-1784.